Digital storytelling is one resource museums have in hand for enriching their offer to audiences and society at large. But how is the museum to author digital storytelling experiences that cater to various needs while maintaining scientific integrity? In this paper, we report on a series of experiences involving the creation of several interactive rich-media museum stories. These digital stories were authored by experts who collaborated in numerous intensive, hands-on participatory design workshops held at high-profile cultural sites: the Acropolis Museum in Greece, the archaeological site of Çatalhöyük in Turkey, and the Stedelijk Museum in Amsterdam. We present the story-authoring methodology and discuss the lessons learned regarding collaborative authoring of museum stories. We conclude with the potential impact this authoring process may have at the institutional level. Keywords: Digital storytelling, museum narratives, participatory design, authoring, mobile guides. Museums aim at making their exhibits appealing and engaging to an increasing variety of audiences while also nurturing their role in conservation, interpretation, education, and outreach. Digital storytelling is one of the resources museums have in hand for enriching their offer to visitors and to society at large. But how is the museum to author digital storytelling experiences that satisfy those various needs and expectations while maintaining scientific integrity? In this paper, we report on a series of workshops involving the creation of several interactive, rich-media museum stories. Digital narrations were authored by experts (museum educators, archaeologists, designers, writers, media producers, and other related professionals) who were brought together and collaborated in numerous intensive, hands-on participatory design workshops. The events were monitored in order to both evaluate the usability of the digital storytelling tools and study the emerging methodologies for story creation. The workshops took place at four high-profile cultural sites: the Acropolis Museum in Greece (http://www.theacropolismuseum.gr/en), whose permanent exhibition includes finds from the Athenian Acropolis and its slopes; the archaeological site of Çatalhöyük in Turkey (http://www.catalhoyuk.com/), a unique Neolithic settlement in southern Anatolia, designated by UNESCO as a World Heritage Site; the Stedelijk Museum in Amsterdam (http://www.stedelijk.nl/en), which hosts collections in modern and contemporary art and design; and the Cité de l’Espace in Toulouse, France, a science center focused on space and its conquest (http://www.cite-espace.com/en). The paper will present the workshops held at the first three of these sites. These events were included within the broader context of the CHESS (Cultural Heritage Experiences through Socio-personal interactions and Storytelling) research project (http://www.chessexperience.eu). The research prototype developed within CHESS includes a number of tools designed to transform traditional story authoring into the design and implementation of personalized, interactive, rich-media mobile applications for museum visitors. During the visit, the CHESS system uses personalized information to create customized stories that guide visitors with mobile devices through the exhibition, deploying simultaneously multimedia, games, and augmented reality. The three-year development of the CHESS project resulted in a fruitful collaboration between technical (research and industrial) and cultural partners, during which important insights were gained into how cultural institutions perceive and adopt innovative mobile-guide technologies. The present paper explores different aspects of interactive digital storytelling by museums. We focus primarily on the collaborative authoring approach by describing the authoring workshops and extracting the lessons learned from the process of authoring interactive stories in different settings by multidisciplinary teams of experts. We also look at the transformations attached to the adoption of this new digital visitor experience creation by cultural institutions and settings. In particular, we are interested in the issues raised by the adoption of new workflows within the organization, the acquisition or training of different experts, and the management of technological requirements. Museums are storytellers by nature (Bedford, 2001; Johnsson, 2006). In order to make objects accessible to visitors, exhibitions provide interpretations through combinations of meaningfully arranged mediators (Hooper-Greenhill, 1999). Within this general principle, museum storytelling has constantly evolved since the first institutions of this kind opened to the public. In the nineteenth century, storytelling was based on labeling and sequential dispositions of objects, which implicitly conveyed the Western evolutionary narratives (Wyman et al., 2011). During the second half of the twentieth century, exhibitions were transformed into more explicit spatial narratives. Mediators were visible and diversified; exhibits were arranged thematically; and the museum’s discourse may have presented different points of view (Twiss-Garrity et al., 2008). At the beginning of the twenty-first century, the influence of digital technologies and social media puts information (the narrative) before objects; explores storytelling on mobile platforms (Galani et al., 2011; Hansen et al., 2012; Lombardo & Damiano, 2012); and pushes museums to make exhibitions not only personalized and interactive, but also open to visitors’ opinions and contributions (Pujol et al., 2013). Museums have graduated from the mere display and presentation of collections to the creation of experiences that respond to their visitors’ evolving needs and expectations. An important change resulting from this evolution of museum storytelling is that museums are moving away from the mere display of objects and are now making their stories central to the visitor experience. Furthermore, they are exploiting the power of stories to foster emotional engagement. As the first, most essential form of human learning (Bruner, 1990), storytelling establishes a universal way of communication; and because it invites audiences to fill in the blanks with their own experiences, it helps to set emotional connections, which can be deeper than intellectual understanding (Bedford, 2001; Springer et al., 2004). As a consequence, objects become closer and more relevant for visitors, conveying different perspectives of the world (Twiss-Garrity et al., 2008), and a wider demographic is attracted to the museum. The current challenge for museums as storytellers is how to successfully turn their institutional knowledge and authority into meaningful, engaging emotional experiences by leveraging the appropriate technological media in the context of their physical settings, and for heterogeneous audiences. In other words, how to “author” the rich experiences that they may want to offer and that their public expects. This daunting task, we argue, cannot be accomplished without the work of collaborative interdisciplinary teams comprising curators, educators, exhibition designers, artists, etc., as most museum design teams are nowadays. The requirement for the creation of holistic storytelling experiences mandates new methods of design with which different disciplines working in the museum are invited to contribute to the design of exhibitions in different phases of the exhibition design cycle. Participatory design is one of the methods originating within the tradition of human-centered interaction design that facilitates the active participation of users in shaping or creating the content of a program or application that targets them (Ciolfi et al., 2007). However, participatory design methods have found limited use in the museum field (Taxén, 2004; Othman, 2012). In this work, participatory design has been the core method of working with cultural domain experts as well as participants from other related disciplines, and engaging them in the authoring of experiences from the outset. Digital storytelling seems to constitute an appropriate foundation for designing and experiencing visits to museum exhibitions. Aspiring to complement the traditional set of exhibit-centered descriptions with story-centered cohesive narrations related to objects, the CHESS project proposed a plot-based approach, where the story authors (e.g., curators, museum educators, exhibition designers) write and produce narratives around preselected museum themes (Vayanou et al., 2014). 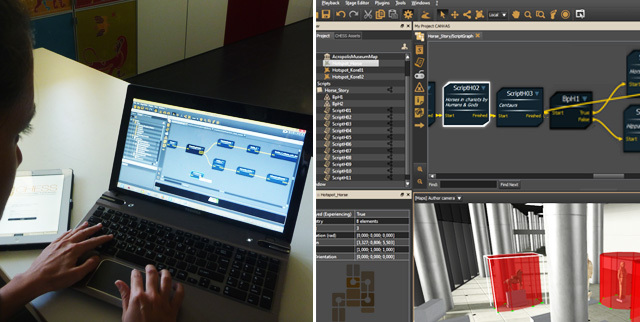 Similar to the making of a movie, the interactive story creation includes four main phases: scripting, staging, producing, and editing. During scripting, the author chooses the main concepts, exhibits, and narrating characters, sketches the plot, and writes the narrative text. In staging, the author closely binds (or checks the association of) the script with exhibits, paths, and other spots in the physical museum space. Then a set of multimedia resources is produced for the staged script, including audiovisual material, interactive images, games, quizzes, or augmented reality applications. Finally, the author edits, selects, and orders the multimedia digital resources to implement the final script into a storytelling experience. To aid the understanding and design of personalization, we created visitor “personas”; that is, empirically grounded, detailed descriptions of imaginary people (constructed user models) that are represented as specific individual human beings (Roussou et al., 2013). Personas are a powerful way to communicate behaviors, goals, wants, needs, and frustrations in an easy to understand manner. The purpose of the visitor personas created for each museum was to serve as an initial guide for the creation of interactive stories tailored to different visitor profiles. Yet, museum experts who have been exposed to the personas insist on their strong presence throughout the development process; they consider them very convenient not only as design tools, but also to convey easily the idea that a particular image, narrative style, subject, narrator, or story unit would be interesting for one visitor category or irrelevant to another. Thus, personas feature among the design tools available to the author when compiling a story. They can be used to “tag” particular story elements and assets such as images, videos, and other material. These persona tags are translated into user characteristics to be later matched with user profiles and personalize the visitor experience. Finally, the CHESS project provides story authors with the CHESS Authoring Tool (CAT), a desktop software environment that enables them to design and implement interactive stories, which are later experienced in situ by visitors on mobile devices (Figure 1). Stories are composed of smaller units that form interconnected pieces of a graph. Authors use the CAT to visualize the structure of their story, including the branching points that link to the different options that correspond to the visitor’s choices; attach the relevant visual and audio assets to each part of the story; and publish the resulting multimedia narrative on the designated mobile device. Figure 1: the CHESS Authoring Tool is used by museum authors to construct interactive (branching) narratives, represented as a graph of story elements. The first round of workshops putting into practice the aforementioned authoring methodology took place at the Acropolis Museum in Athens, Greece. The idea of a storytelling-based digital guide was embraced with great interest by the Acropolis Museum staff; hence, there was experimentation with different authoring methodologies throughout the duration of the project. In the first iteration, the approach adopted involved several professionals working sequentially. This resulted in a time-consuming back and forth at different authoring phases in order to refine the content. In the second iteration, the same professionals held several meetings in order to solve together the issues arising in the different authoring steps. This second approach crystallized in a creative hands-on group activity workshop held at the Museum in September 2013, which aimed at evaluating the entire story-authoring process. The workshop involved CHESS project members, staff members of the Acropolis Museum and the Acropolis Restoration Service, and a number of invited “external” contributors. Participants were preassigned to one of two groups so that each group included individuals covering key areas of expertise (Figure 2). As a result, each group comprised two archaeologists, a museologist, a writer, an expert from the creative industries, an educator, and a host-archaeologist. Additionally, the two groups were supported in the authoring and production of the storytelling experiences by individuals with expertise in audio recording, image processing, etc. Figure 2: the first authoring workshop at the Acropolis Museum was a creative hands-on exercise with two interdisciplinary groups of participants. Each group was provided with information about the general theme of the story to be created (“the perception of snakes in Archaic Athens”), about the exhibits related to it (in the form of archaeological texts and images), the exhibits’ locations in the Museum’s Archaic Gallery, indicative visual assets, and other available resources. The groups were also given specific visitor personas to design for: a middle-aged man and a teenage boy. Each group had to come up with a story experience for their particular visitor persona, include as many of the given museum artifacts as possible, stage the story in the Archaic Gallery (Figure 3), produce it using the CHESS software, and present the result at the end of the day (Figure 4). Figure 3: Group A (left) and Group B (right) staging their story experience in the Acropolis Museum’s Archaic Gallery. Participants greatly enjoyed this creative process, and since the conceptualization of the story had taken most of their time, they decided to continue working on their stories after the workshop had concluded. In the following days, they had group meetings and e-mail and file exchanges. In fact, the groups ended up engaging in an informal “competition,” each aiming at completing the best story first. Consequently, a follow-up workshop was convened two weeks later, in October 2013, in which the two groups came together to present their stories and discuss the issues and shortcomings of the process. Figure 4: testing and presenting the stories created during the Acropolis Museum workshops. More than a year later, in December 2014, a slightly different two-day authoring workshop was organised at the Acropolis Museum as part of an eCultValue project event. This time, a different international group of curators, cultural technologists, and students in various fields of study, external to the Acropolis Museum, were invited and asked to form small teams of three persons to work together on particular authoring tasks (Figure 5). After a short guided tour of the Museum’s Archaic Gallery, all teams were given the specific requirements and material on which they would base their formulation of scenarios for a personalized digital storytelling experience. Participants were instructed to focus on particular artifacts of the Museum, which had been briefly presented. They had to select up to three specific artifacts and also select one of the six museum personas already developed and described for them in the printed material. The groups collected and discussed the main points of general interest, as well as specific details of a more anecdotal nature. In addition, the teams had to conceptualize a “smart object” (e.g., a tangible object serving as an interaction device), which future visitors would use to interact with the exhibits of the specific experience within the particular museum setting (Petrelli et al., 2013). Ideally, a low-fidelity prototype outlining this smart object’s main functionality and appearance, and also predicting possible practical and technical challenges, was sought. 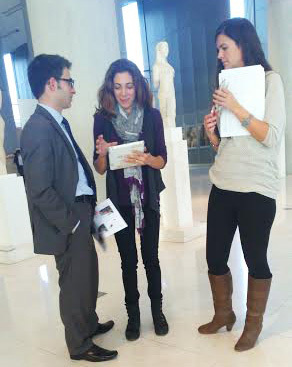 Figure 5: participants from various disciplines conceptualize stories in groups of three at the Acropolis Museum. After the given time ended, all participants convened in a central room, where each team presented the personalized story they had created and the smart objects they had prototyped. All participants seemed very enthusiastic about sharing their outcomes. Although the time provided to them in the Gallery was short, the story concepts presented were imaginative and the smart objects proposed were creative. In July 2014, a digital storytelling workshop was organized at the Visitor Center of the Neolithic settlement of Çatalhöyük. Specialists congregate annually at this active archaeological site to conduct field and laboratory-based research. Accordingly, the workshop’s participants comprised seventeen members of Çatalhöyük’s various specialist teams, including conservators, media specialists, resident artists, IT specialists, heritage students, and archaeologists of different background (with concern for visual interpretation, architecture, stone tools, human and animal remains, stratigraphy, excavation, botany and geology, etc.). These specialists are only rarely directly engaged in interpretative work for non-specialist audiences at Çatalhöyük, hence their gathering together at the site offered an opportunity to rethink both the visitor interpretation approach and also the dynamics of professional collaboration itself. Ultimately, the authoring session focused on scripting stories for a particular—very long excavated—building on site (Building 52), a process that was enriched by the many perspectives brought to bear on the diverse archaeological evidence. Following the participants’ normal working day on site, they gathered one evening into three groups of five to six, with each member strategically assigned to the teams to ensure a representative distribution of subject specialists. Information related to Building 52 was compiled from annual reports, diaries, the local site database, and associated publications, and separated out into a plethora of stand-alone, self-contained units (Figures 6 and 7), coded by color (one color for each theme), with basic conceptual and/or semantic links between each. Groups were distributed copies of these theme cards, a page of paper outlining the requirements of the authoring process, alongside auxiliary graphic material for enabling note-taking and storyboarding. 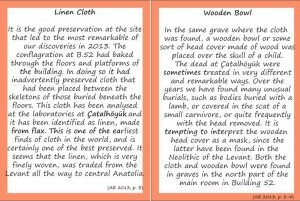 Figure 6: cards used for the theme of “Special Artifacts.” The left card includes information about an excavated linen cloth, and the right card describes a wooden bowl found in a burial in Building 52. The “theme card” concept enabled different experts to choose from one or more themes (color on card) and various segments of information (cards) in order to draw together diverse events into one coherent narrative about Building 52. 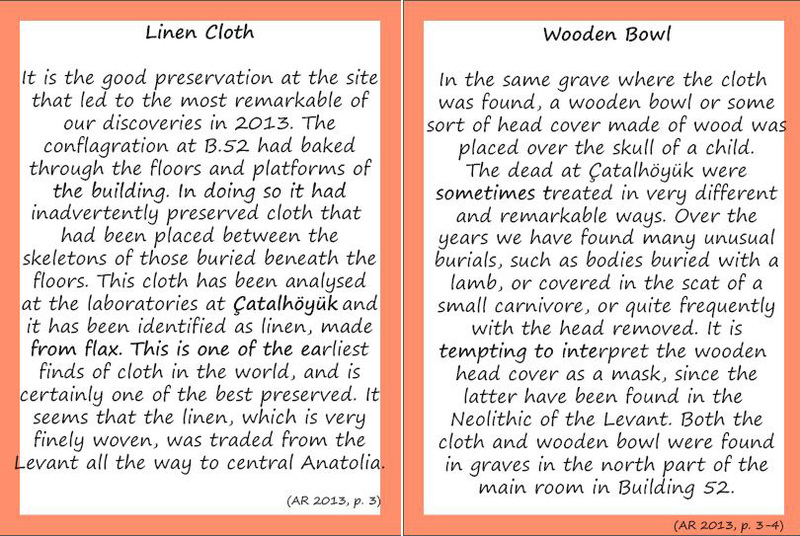 It is interesting to note that these “themes” (effectively containers of information) were designed to correspond not necessarily to historical topics (as in the case of the Acropolis Museum), but either to types of archaeological evidence (e.g., the “artifact theme,” “building construction phases theme,” “human remains theme,” etc.) 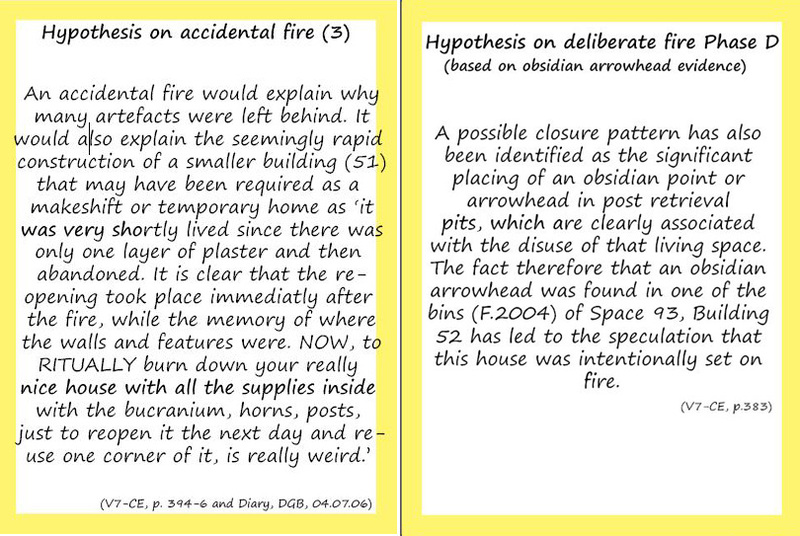 (Figure 6) or to a series of broader hypotheses about the building as expressed by archaeologists in their reports and publications (Figure 7). Overall, the storyboarding session (Figure 8) lasted approximately two hours, and in the end each group presented their story to the full workshop audience. From there, one of the three stories was selected as the basis for a digital storytelling demo application. The story plot was further developed in order to serve specific requirements of the visitor experience and engagement with the archaeological site and its features (based on six years of qualitative and quantitative data collection with stakeholders). The written script was transcribed, and an audio recording of it was prepared, as well as two avatars and a variety of specialist field imagery related to the story. These assets were integrated into the CHESS Authoring Tool, resulting in an interactive narrative that was accessible via tablets on site. Nine video-recorded test runs of the technology were conducted with members of the site team and visitors, followed by audio-recorded evaluative interviews with participants. 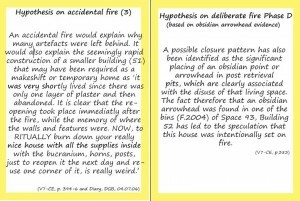 Figure 7: cards used for the theme of “Fire Debate.” The left card includes different types of evidence from different resources that support the hypothesis of “accidental fire” in Building 52, while the right card includes a single source of evidence to support the hypothesis of “deliberate fire” in the same building. Based on our observations and feedback sessions, participants had different uptake and interaction with the theme cards and chose different approaches for crafting their stories. Two of the three groups adopted a more loose and flexible process of storyboarding with the use of provided graphic material (Figure 8), while the third group wrote a thorough and cohesive script after only basic planning and discussion. Similarly, some participants applied the cards only at the beginning of the session, while others, such as the group that chose the script-writing method, used the prompt cards throughout the authoring session as the base of their script. Figure 8: participants brainstorming and storyboarding during the authoring session at the Visitor Centre, Çatalhöyük. While the definition of a coherent plot, connecting and contextualizing the artwork-specific script pieces, was an important part of the scripting phase in the previous experiences, the participants at Stedelijk decided to minimize the creation of new script pieces and instead use the existing ones (along with their productions), thus focusing on the staging and editing phases of the authoring methodology. Figure 9: members of the Stedelijk Museum and the CHESS project collaborating on the creation of interactive guided museum visits. Based on these requirements and constraints, the members of the CHESS team cooperated with the Steledijk Museum to design interactive guided visits, evolving within the museum environment. To that end, the museum map was annotated with a set of selected exhibits. The digital assets (script, audio, images, videos) that were more or less related to each exhibit were uploaded to a shared space, and a flowchart was drafted. Then, through an iterative process of discussions and refinements over the flowchart and the annotated museum map, a first staged and scripted graph was formulated (following the CHESS storytelling model) for the representation of the envisioned interactive guided tour. The workshops at the Acropolis Museum provided invaluable early results about the CHESS authoring process. The main outcome was that the design of digital storytelling experiences for archaeological museums (and probably for cultural settings in general) is a multilayered creative process requiring interdisciplinary authoring groups. Both groups in this workshop included members with complementary skills, and thus the tasks flowed in a natural, implicit way: storytellers guided the process and composed draft scenarios in a word processor; archaeologists checked and/or provided the content; museologists advised about user needs and the development of the story in relationship with the gallery and the exhibits; and finally, designers contributed with the creation of assets. It is interesting to note that experts were in some cases from the same organization (Çatalhöyük), in other cases from the same organization in combination with external participants (first workshop at the Acropolis Museum), or even all external (second workshop at the Acropolis Museum). Not knowing each other or not working together on a daily basis did not seem to pose any problem. This seems to indicate that the important factor is really the combination of different skills and perspectives, which gave the participants a more holistic view of the content. However, the second authoring workshop at the Acropolis Museum showed that the team size is also relevant. The small number of participants in each team (three), seemed to work positively for the time available, allowing participants to arrive at decisions more quickly. As one of the participants commented, “The time pressure was also a factor to produce results without delays.” So, teams should be neither too small (because it reduces creativity) nor too big (because it hinders decision making). These results have clear implications for the museum’s internal organization, or at least for the internal workflows regarding exhibition design. While opening up to new audiences and ways of communication, museums as institutions still tend to be very hierarchical or compartmentalized. Digital storytelling requires synchronous, collaborative work among different departments, even with external experts, which clearly breaks open the traditional institution as we know it. What’s more, the physical and institutional boundaries of the brick-and-mortar museum are on the way to be further blurred, as new interactive and social media allow, or even demand, that audiences too participate in the storytelling process. All participants described their experience as positive, creative, and engaging. The teams were surprisingly creative, taking into account that they were put together as a team only for the particular event. This may be related also to the methodologies adopted. For example, in all cases participants took advantage of the concept of story narrators in different and creative ways, ranging from a character telling the story (in the case of the prehistoric girl Abla in Çatalhöyük) to dialogue between characters (Athena, Hercules, and a snake) in the case of the snake story developed at the Acropolis Museum’s workshops. Personas also seemed to be very comfortably adopted and used in this design domain in order to better take into account the visitor perspective. Finally, another positive resource was the story cards. The “theme card” concept enabled different experts to choose from one or more themes and various segments of information in order to draw together seemingly unrelated events into one coherent narrative. From the storytelling perspective, it is interesting to note that the group that built the most coherent narrative was the one that used the prompts the most. This confirms the suspicion that designing engaging storytelling experiences in museums is not necessarily a matter of scientific expertise but of narrative methodology and creativity. working through a narrative makes you realize what we don’t know… It makes you think about experience a lot more… People were saying: “Wait, we don’t know that. Do we know that? What do we know? How do we know it?” It just makes you ask those fundamental questions, and it changes the focus of research in what I think is a really positive way. Rather than saying: what materials do we have and what do they tell us… it makes you draw it together. Another archaeologist suggested even more dramatic effects, what he called a form of “liberation,” both from the hierarchy and bureaucracy of the site itself and its standard approaches to data analysis and interpretation, and also from the conventional format of archaeological reporting and publication. The fact that his team was provided with a looser structure, with a purposefully playful and open scheme where stories and narrative were the hinge (as opposed to isolated data points), meant a resonant experience overall. Similarly, multiple participants called for this type of activity to be woven into basic archaeological practice in the future, to be part of the research endeavor itself as opposed to a tack-on summative entertainment effort disconnected from larger intellectual engagements with the excavation process. Taken together, the authoring exercises at Çatalhöyük stimulated unanticipated methodological debate and conceptual collaboration among the site’s specialists. The significance of such outcomes is weighty, as it speaks to a possible impact on academic knowledge-making itself. Another important point is the iterative nature of the task. The production of digital interactive personalized stories for museums needs systematic refinement. Yet to keep iterations to the optimal minimum number, it is paramount that staging (i.e., the development of the story in the exhibition space) is taken into account during the whole process. Staging can be done in different ways. The workshops showed that no matter the author’s familiarity with the gallery or the quality of available gallery maps, storytelling is improved by the real feeling of the space. For the cases where the participants did not spend time early on in the gallery/site, the produced stories had issues with visitor navigation and positioning in relation to the exhibits. Although they were exciting stories, they needed tweaking to be more effective in relation with the gallery or site’s spatial arrangement. Overall, the most difficult part for the participants was not to find and articulate ideas, but to decide what to keep or reject. The need for previous training/experience in the authoring process was evidenced by the fact that one of the groups at the Acropolis Museum workshop, which included an experienced author, completed the task more quickly because he organized the process and was aware of the special requirements of the authoring methodology (e.g., navigation, staging, interaction). This evidences that the design and implementation of interactive digital storytelling experiences require that the authors be trained not only in the use of the authoring tool, but also in the overall authoring methodology. Cultural heritage professionals are less familiar with the new aspects introduced by digital tools (interaction, personalization, non-linearity) and need guidance to assimilate them. The experience at the Stedelijk Museum, where again we find a different authoring context with different goals and needs, provided other insights about storytelling in museums. In this case, the authors did not invest that much in the initial scripting, but rather put the emphasis on the staging and editing phases of the authoring process. The development of the experience and the results provide two important conclusions. First, it points out the capacity of digital storytelling to link not only exhibits under different discourses, but also existing digital and analog assets, which can be “recycled” into engaging narrations. This is important given the fact that digital productions still constitute a major economic and personal effort for museums. Second, as previously mentioned, it points out the importance of the physical environment and the requirements imposed by the fact that it is not a simple location, but a semantic space, already endowed with meaning. In this sense, visually drafting stories by means of graphs coupled with gallery maps in situ appeared to be a powerful tool for collaborative design. With the widespread adoption of interactive digital exhibits and mobile technologies, storytelling in a museum is taking new forms, incorporating such mechanisms as branching narratives, personalization, and adaptivity to visitor behavior and actions. This raises significant new challenges for museums with respect to their roles as digital storytellers in the new experience economy. In this paper, we presented different digital-experience authoring workshops, held at a high-profile archaeological museum in Greece, a UNESCO archaeological site in Turkey, and a contemporary art museum in the Netherlands. Our experience from these workshops suggests that interdisciplinary and collaborative authoring fosters proactive attitudes in cultural domain experts and museum staff, leading to different, new approaches towards not only knowledge communication but also scholarly interpretation. Nevertheless, digital experience (co-)creation is not without challenges. On the one hand, it must consider the redefinition of the museum’s internal organization or workflow, which now has to open to horizontal but also external exchanges (i.e., with professionals from outside the institution). On the other hand, pure academic skills are no longer enough; authors need to have an interdisciplinary background or at least to become familiar with new methodologies (e.g., visitor-centered design, less academic and emotionally evocative storytelling techniques) and tools (e.g., authoring and publishing software). However, the results of our experience within the CHESS project, regarding both visitors and cultural domain experts, lead us to believe that these efforts are worthwhile and that museums can become essential creators of their own interactive digital experiences. Part of this work has been conducted in the context of the CHESS project that received funding from the European Union’s 7th Framework Programme for research, technological development, and demonstration under grant agreement no. 270198. The authors would like to acknowledge the contribution of the Acropolis Museum and its president, Professor Dimitrios Pandermalis, in the CHESS project and in supporting and hosting the numerous meetings and workshops. The prototyping work at Çatalhöyük received financial support from the British Institute at Ankara. The workshop with Amsterdam Smart City at the Stedelijk Museum was supported by the eCultValue project’s Living Labs initiative. We especially wish to thank Thibaut Prados (Diginext), Jens Keil and Timo Engelke (Fraunhofer IGD), Vassilis Kourtis (University of Athens), Stamatia Eleftheratou (The Acropolis Museum), Erna Bommers (Stedelijk Museum), and Professor Ian Hodder (Stanford University) in supporting the workshops. We also thank all of the workshop participants and staff of the different cultural institutions for their lively participation. Bruner, J. S. (1990). Acts of Meaning. Cambridge, MA: Harvard University Press, 208. Ciolfi, L., L. J. Bannon, & M. Fernström. (2007). “Visitors’ Contributions as Cultural Heritage: Designing for Participation.” In J. Trant & D. Bearman (eds.). International Cultural Heritage Informatics Meeting (ICHIM07). Toronto, Canada: Archives & Museum Informatics. Galani, A., D. Maxwell, A. Mazel, & K. Sharpe. (2011). “Situating Cultural Technologies Outdoors: Design Methods for Mobile Interpretation of Rock Art in Rural Britain.” In J. Trant & D. Bearman (eds.). Museums and the Web 2011. Archives & Museum Informatics. Hansen, F. A., K. J. Kortbek, & K. Grønbæk. (2012). “Mobile Urban Drama: interactive storytelling in real world environments.” New Review of Hypermedia and Multimedia 18(1–2), 63–89. doi:10.1080/13614568.2012.617842. Hooper-Greenhill, E. (ed.). (1999). The Educational Role of the Museum (Leicester readers in museum studies). London, UK: Routledge, 364. Johnsson, E. (2006). In C. Adler (ed.). Telling tales. A guide to developing effective storytelling programmes for museums. London, UK: London Museums Hub, Museum of London, 36. Lombardo, V., & R. Damiano. (2012). “Storytelling on mobile devices for cultural heritage.” New Review of Hypermedia and Multimedia 18(1-2), 11–35. doi:10.1080/13614568.2012.617846. Othman, M. K. (2012). Measuring Visitors’ Experiences with Mobile Guide Technology in Cultural Spaces. The University of York. Available http://etheses.whiterose.ac.uk/4067/1/MK_OTHMAN_Thesis_PhD.pdf. Roussou, M., A. Katifori, L. Pujol, M. Vayanou, & S. J. Rennick-Egglestone. (2013). “A Life of Their Own: Museum Visitor Personas Penetrating the Design Lifecycle of a Mobile Experience.” In CHI 2013 Extended Abstracts on Human Factors in Computing Systems – CHI EA ’13. New York, New York, USA: ACM Press, 547–552. doi:10.1145/2468356.2468453. Twiss-Garrity, B. A., M. Fisher, & A. Sastre. (2008). “The art of storytelling: enriching art museum exhibits and education through visitor narratives.” In J. Trant & D. Bearman (eds.). Museums and the Web 2008. Montreal, Quebec, Canada: Archives & Museum Informatics. Vayanou, M., et al. (2014). “Authoring Personalized Interactive Museum Stories.” In A. Mitchell (ed.). The Seventh International Conference on Interactive Digital Storytelling (ICIDS 2014), LNCS 8832. Springer International Publishing Switzerland, 37–48. Wyman, B., S.Smith, D. Meyers, & M. Godfrey. (2011). “Digital Storytelling in Museums: Observations and Best Practices.” Curator: The Museum Journal 54(4), 461–468.
. "The museum as digital storyteller: Collaborative participatory creation of interactive digital experiences." MW2015: Museums and the Web 2015. Published January 31, 2015. Consulted .